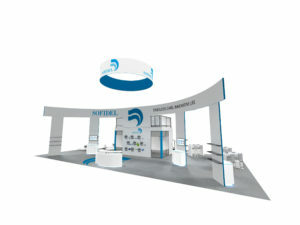 At New York Exhibit Rentals, we provide booth designs that are highly flexible and customizable. Look through all of the great examples below to mix and match different elements from various booths to create a design that works best for you and your brand. 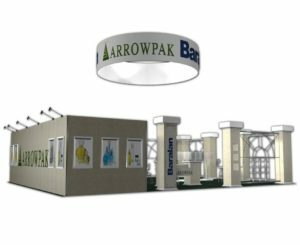 After browsing through the many options and you've found a better idea of what you're looking for, contact our team of trade show professionals to get more information on pricing and a free booth design rendering. We provide our rental exhibits in New York and all around the country. 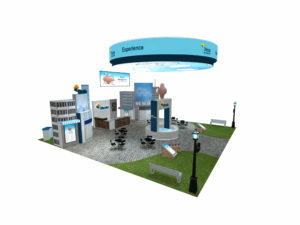 The 50x50 Celgene rental exhibit is a booth that has a lot of elements combined to create a state of the art display. It features a large circular hanging sign with bright graphics and imagery. In addition, several benches and kiosks make this exhibit inviting and client-friendly. Interactive monitors and the overall "city" theme of this booth makes it a true masterpiece. 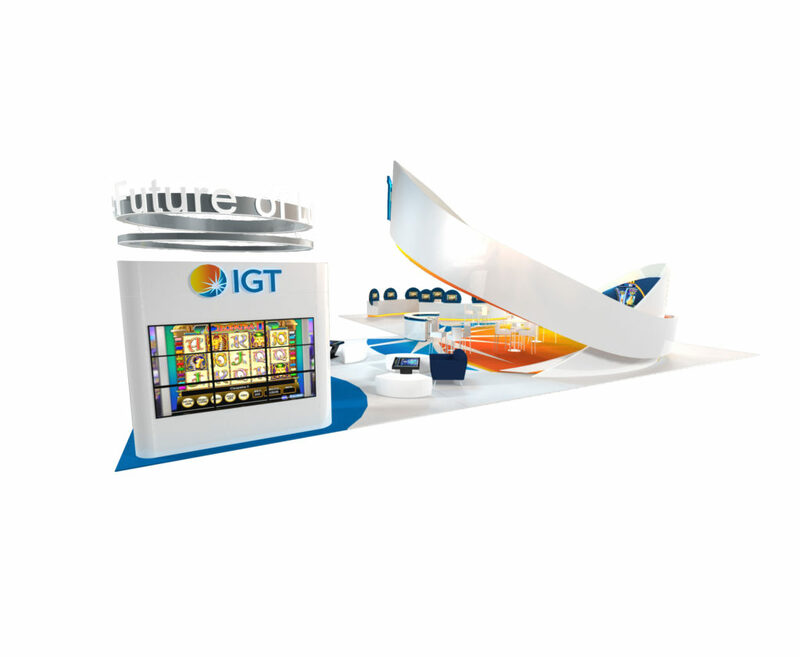 If you're looking for a futuristic and modern design for a booth, check out the 60x60 IGT exhibit. This rental features a larger floating sign that displays the companies logo clearly for all show attendees to see, as well as smaller hanging signs on each side. Additionally, there are various seating areas with couches and interactive screens where clients can learn more about your offerings as a company. 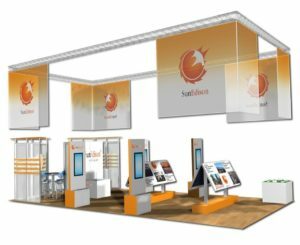 This 30x60 Sofidel rental exhibit has a clean and sleek design that is sure to turn heads at your next trade show or event. Curved graphic panels set the structure for the whole display, which includes a second-floor meeting space, as well as a private meeting room at the bottom. Also, this booth includes seating areas and tables where clients can sit and discuss business. The 30x50 Philippines Tourism rental exhibit is a 30x50 rental has a lot going on it. All of the panels that make up this display feature vibrant and colorful graphics that really make the branding pop. Additionally, several interactive digital monitors, counters, and seating areas that are included in this exhibit contribute to an inviting space for show attendees and potential clients. 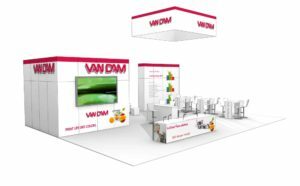 WOW the crowd at your next trade show or event with a design like that of the 30x40 Van Dam rental exhibit. This is one of our larger displays. It features a large square sign overhanging this whole space, as well as graphic panel structures throughout. The added seating area creates an inviting environment for potential clients to come and talk business. 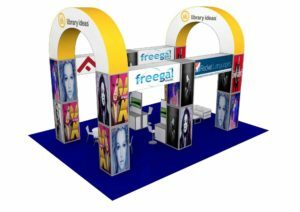 This 30x40 Library Ideas exhibit is a trade show booth like never before seen. It's structure consists of two towering panel structures with a curved arch that has colorful graphics and branding. Also, various seating areas with couches and tables make this space inviting for show attendees. Add in interactive kiosks with digital monitors to really blow the crowd away with this rental exhibit. This 30x50 Arrowpak exhibit features a unique yet simple design. Graphic panel pillars make up the structure of the booth, and they provide a new way to display product to clients. Add on custom glass display cases and several seating options to enhance the look of this booth. Also, the back of the booth features an additional storage area that can also double as private meeting space. 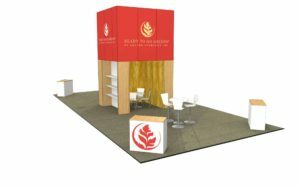 Creating a lasting impression with the Suttonfern 20x40 rental exhibit. This booth features a simple yet sophisticated design. Included in this display is a large, towering central panel display with built-in shelving on 3 sides. A single side is open to show a semi-private meeting area with a table and chairs -- perfect for meeting with potential clients and business partners. This island layout also includes reception counters on each corner of the exhibit. 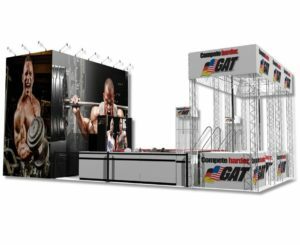 If you are looking for a more modern and industrial theme for your next trade show booth, check out the GAT 20x40 rental exhibit. Custom panel graphics and metal framing make up the structure of this display. Additionally, stem lighting is used to enhance the graphics, and a multitude of seating options, counters, and a large monitor complete this large booth. Check out the unique design of the 20x40 Sun Edison booth. This rental exhibit features four hanging signs attached to metal framing over the entire space. Throughout this exhibit, attendees can also interact at kiosks that include digital monitors that can display product or company information. In addition, at the back of this booth, there is a semi-private meeting area where you can discuss business with potential clients or partners. 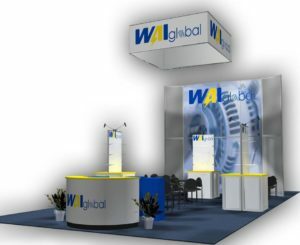 The 20x40 WAI Global design is one of our larger exhibits that includes all of the must-haves of a great rental booth. The back wall is constructed of graphic panels that conceal a private meeting room where you can discuss business with potential clients. Several other seating areas are laid out along the front of the display, and some have counters with shelving units attached. 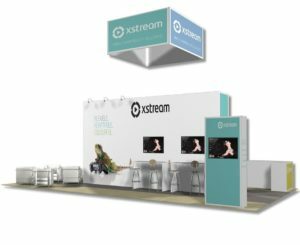 If you're looking for a large, island rental design, consider the 20x40 XStream exhibit. This booth features a center panel wall that has digital monitors on each side. Additionally, stem lighting is strategically placed to illuminate the graphics. The center wall also doubles as a storage area, with a door hidden on one end. Also included is a seating area in one corner with couches makes completes the overall atmosphere of this booth. 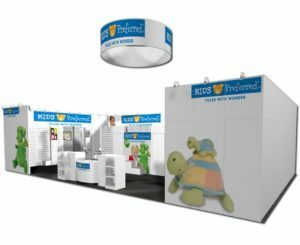 The 30x50 Kids Preferred rental exhibit is perfect for retail trade shows where you have a large booth space booked. The booth is semi-enclosed with graphic panels and the interior features slat walls that are perfect for displaying product. In addition, there are two private meeting areas for client meetings as well as seating areas throughout the exhibit. 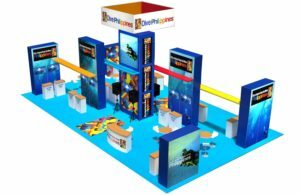 The 30x50 Spinmaster rental booth is a huge trade show exhibit that is comprised of many differing elements. This inline display is enclosed on 3 sides by graphic panel walls. 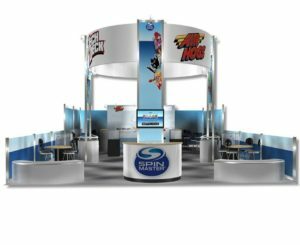 It features multiple seating/meeting areas and large-scale circular signage that will make your brand stand out at the show.